When evaluating men’s health, clinicians can be myopic by primarily considering prostate health and optimizing testosterone levels. Could the missing link to men’s health be proper cortisol management? The effects of high cortisol and consistent stress is nothing new to practitioners or patients; however, is there validity to support balancing cortisol specifically for men? Physical exercise comes into play when evaluating the topic of proper cortisol management within men. Exercise is a valuable tool recommended by practitioners, different forms exercise has been shown to have a positive influence on testosterone levels within males.2 Ensuring adequate exercise recovery is also essential, as elevated cortisol levels are common post-workout.3 The physiological response to high-volume exercise compared to high-intensity training has been studied in male athletes. The results concluded high-volume training leads to higher 30-minute post-workout cortisol levels and higher muscle damage when compared to high-intensity resistance exercise.4 A potential shortcoming of the study is that the time of day of exercise was not noted. Patients with a busy schedule may exercise in the evening; could this potentially have an influence on quality of sleep? On the topic of sleep, a crossover randomized controlled trial based out of Brazil looked at the effects of both alcohol intake and one night of sleep deprivation in men.5 Male participants completed a mood state questionnaire before and after the trial. Results concluded that changes in the mood state questionnaire and higher levels of fatigue were associated with changes in cortisol levels. The role of cortisol in athletes has been the subject of several trials, some of which may have relevance off the field. In one trial, elite-soccer players’ hormone levels including cortisol when playing at home and away venues were evaluated and shown to be higher at the home game when compared to away game cortisol levels.6 Home-field advantage is classically associated with a more comfortable atmosphere, nevertheless an added pressure to bring home the win. A second study looked at elite male basketball players and the salivary hormone response when competing with teams of different levels (easy, medium, and hard.7 As expected, elevated cortisol was observed for all levels; however, the biggest increase in cortisol and nervousness (pre-match and post-match) was reflected in players competing against a hard team. While not all patients are elite athletes, the results of these studies are potentially parallel to when a man is playing on his “home field.” Imagine an important client visiting the office rather than meeting them in their office or plant. What if the field team comes to visit home office? Or perhaps the most glaring example in everyday life is actually being at one’s residence managing a family versus at work managing direct reports. And that leads to questions of cortisol and social situations. A known disparity exists in how individuals with higher levels of the hormones testosterone and cortisol handle social situations when compared to those with lower levels.8 To evaluate the role of the hormones in friendship formation, testosterone and cortisol levels were assessed at baseline and after either a “high” social activity or “low” social activity. High and low were categorized by the level of self-disclosure. Higher testosterone levels were associated with feeling less close those with lower levels of testosterone. Additionally, the results concluded a drop in cortisol levels in the close group, furthermore those with lower levels of cortisol continued to desire more closeness. 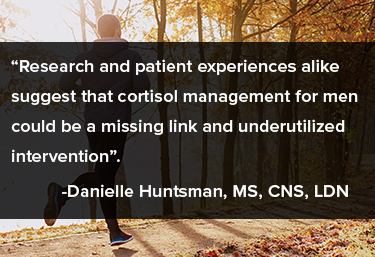 Research and patient experiences alike suggest that cortisol management for men could be a missing link and underutilized intervention. Unaddressed elevated cortisol or consistent stress can influence a myriad of health goals and should be addressed appropriately. Danielle Huntsman, is a certified nutrition specialist and licensed nutritionist. She holds an MS in Nutrition and Integrative Health from Maryland University of Integrative Health and is a graduate of the College of Charleston. Danielle has a special interest in gastrointestinal and endocrine health, supporting clients through an integrative approach with proper diet and nutrition. She actively sees clients remotely and within the Philadelphia area. Bertagna X. Effects of Chronic ACTH Excess on Human Adrenal Cortex. Front Endocrinol (Lausanne). 2017 Mar 8;8:43. doi: 10.3389/fendo.2017.00043. eCollection 2017. Herbert P, Hayes LD, Sculthorpe NF, Grace FM. HIIT produces increases in muscle power and free testosterone in male masters athletes. Endocr Connet. 2017 Aug 9;6(7):430-6. Hackney A, Waltz E. Hormonal adaptation and the stress of exercise training: The role of glucocorticoids. Trends in Sports Science. 2013;4(20):165–71. Bartolomei S, Sadres E, Church DD, et al. Comparison of the recovery response from high-intensity and high-volume resistance exercise in trained men. Eur J Appl Physiol. 2017 Jul;117(7):1287-98. Rodrigues R, Franke RA, Teixeira BC, et al. Combined and Isolated Effects of Alcohol Intake and One Night of Sleep Deprivation on Mood States, Hormonal and Inflammatory Responses in Healthy Male Adults: a Crossover Randomized Controlled Trial. Chin J Physiol. 2017 Dec 31;60(6):327-37. Fothergill M, Wolfson S, Neave N. Testosterone and cortisol responses in male soccer players: The effect of home and away venues. Physiol Behav. 2017 Aug 1;177:215-20. Arruda AFS, Aoki MS, Paludo AC, Moreira A. Salivary steroid response and competitive anxiety in elite basketball players: Effect of opponent level. Physiol Behav. 2017 Aug 1;177:291-6. Ketay S, Welker KM, Slatcher RB. The roles of testosterone and cortisol in friendship formation. Psychoneuroendocrinology. 2017 Feb;76:88-96.